Home / Newsletter Articles / Sequence the Summer Away! Ah, summer! It’s the time that most of us spend outside–at the pool, relaxing in the sun, and just having fun. We often look at our NACD programs as a separate part of our day, but that doesn’t have to be the case. You can make your program a part of your day and have fun doing it. Summer is a great time to advance your child’s sequential processing. There are many fun ideas to incorporate while outside in the water or while playing in the back yard. It is simply a matter of remembering to look for opportunities. I hope the following suggestions spur you on to think about how to incorporate processing into your fun-filled days. Squirt guns – I have two boys and a girl. My boys LOVE squirt guns. We turn this into a processing activity like this: I hold the gun filled with water and give a sequence to one of the boys. If they get it right, I squirt them. They love it! (If your child doesn’t like to get wet, then only squirt them if they get the sequence incorrect.) I switch between the two boys, squirting at them after getting a sequence correct. I only spend a few minutes doing it, but it produces very HIGH intensity! If they BOTH do well, then they get to squirt at me! For the little ones – take advantage of pool time, sprinklers, and playing at the park or swinging. My daughter loves me to throw her in the air while in the pool. She also likes jumping in. Before she does any of these, I give her a sequence. If she gets it right, she gets thrown or jumps in. If she doesn’t, I might give it to her again or give her a different one that she can be successful with, and then provide the reinforcer. While at the park, she loves me to push her on the swing. So before a big push, I give her a sequence. I don’t do it every time, just one here and there to keep it novel. But over the course of a day, she is getting many. They add up! If you are working on teaching 1-step directions to your child, the above activities work for that as well. They really provide a lot of intensity –lots of high frequency, but very SHORT bursts of duration. Outdoor scavenger hunts – “Go find something that is soft, two things that are green, and something that blooms.” Give your child a bag and have them go out to the backyard and search away. This really challenges your child’s working memory and conceptual thought. Ask for more and more items and be sure to give them different things to hunt each time. Hose/water sprayer – My middle son LOVES to water the flowers and anything else he can get wet. So it works well to give him sequences of things to water. So for example, “Marc, I would like for you to water the peppers, the purple petunias, the pink rose bush, then the snapdragons.” Not only is he sequencing, he is learning the names of plants and flowers! 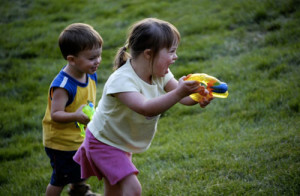 Get the neighbor kids involved – In our neighborhood the kids are always playing together at some time during the day. They love for the adults to interact with them. I line them all up, give them each an auditory digit span (forward and reverse), and then let them earn a popsicle from our freezer. I promise—your neighbors won’t mind if you improve their children’s sequential processing! For the older kids/adults – Schedule Simply Smarter into your day, rather than waiting for a convenient time to come along to do it. If you know that you have errands to run, lessons to attend, work to go to, program to get done with your children, etc., then schedule it! Each day look at your day and carve out 15-20 minutes to get it done. For me, the earlier the better! Reward yourself later with some fun in the sun! You can have fun with processing. Think outside the box, think about the activities, and make them part of your everyday experiences with your kids. Have a great, safe summer!